IT'S A CUSTOM IN IRELAND. Copyright, 1892, by Frank Tousey. Entered at Stationers' Hall, London. Is a custom in Ireland. That's a custom in Ireland. And then we had ructions and destructions. By the hokey we enjoyed ourselves on my wedding day. 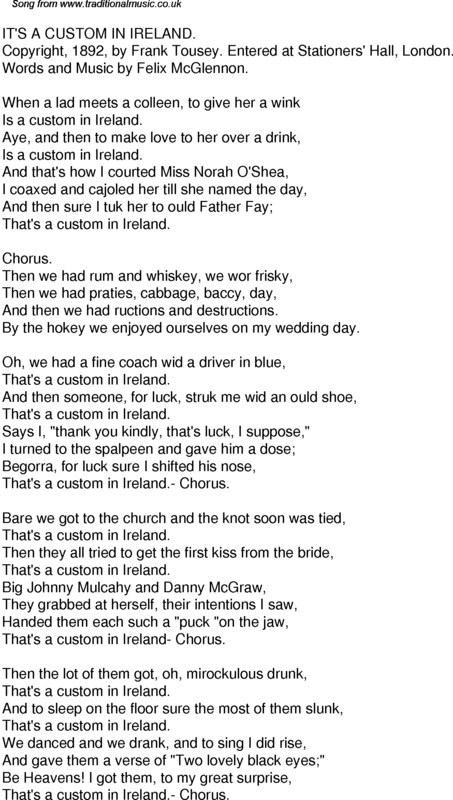 Says I, "thank you kindly, that's luck, I suppose,"
That's a custom in Ireland.- Chorus. That's a custom in Ireland- Chorus. And gave them a verse of "Two lovely black eyes;"